After Newtown: Guns in America re-aired August 2013. Explore America’s enduring relationship with firearms. In April 1775, it took each Minuteman fifteen seconds to load, aim, and fire a single musket at the advancing British Redcoats in Lexington, Mass. In December, 2012, at a primary school in Newtown, Conn., Adam Lanza was able to fire off dozens of rounds with an assault-type weapon in a mere sixty seconds. Gun technology has evolved a great deal since the Colonial era. So too has America's gun culture. With an estimated 300 million firearms in circulation, many argue that the nation is inundated with weapons and fear the human toll they've taken is too high. Over 30,000 people die each year from a gun-related injury. At the same time, guns are enjoyed by tens of thousands of Americans for sport, and many more rely on them for self-defense. 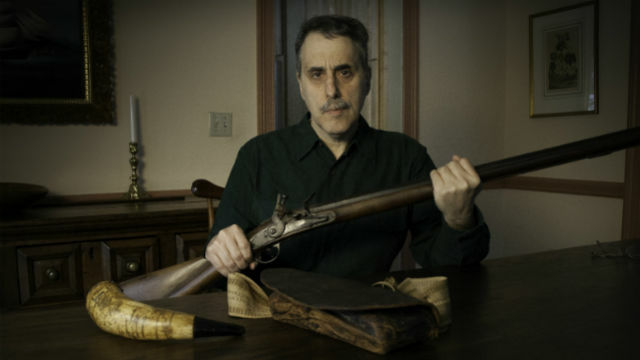 Artist Don Troiani. Courtesy Jonathan Silvers, Saybrook Productions. After Newtown: Guns in America is an unprecedented exploration of America's enduring relationship with firearms. From the first European settlements in the New World to frontier justice; from 19th Century immigrant riots to gangland violence in the Roaring Twenties; from the Civil War to Civil Rights, guns have been at center of our national narrative for four hundred years. Americans have relied on guns to sustain communities, challenge authority, and keep the peace. Efforts to curtail their distribution and ownership have triggered epic political battles. On one side, the cry for gun control gets louder with each mass shooting. And on the other, Charlton Heston's 2000 rallying cry, "From my cold, dead hands," still resonates across the land. Featuring the personal reflections of Bill Cosby, Frank Serpico, and NRA President David Keene, among other experts and advocates, this unique documentary will examine the evolution of guns in America, their frequent link to violence, and the clash of cultures that reflect competing visions of our national identity. After Newtown: Guns in America was produced by Saybrook Productions.